Dolphin rings by Whitfield Jack Jewelry Genius, Inc. If you're a fan of marine animals and love the graceful beauty of dolphins, selecting dolphin-themed engagement and wedding jewelry is a natural choice. You can find everything from diamond engagement rings with a dolphin motif to wedding bands featuring this beloved mammal. There are even a few retailers who specialize in this unique type of bridal jewelry. Seawear specializes in nautical jewelry of all types, and they have a great selection of dolphin rings. Most of Seawear's dolphin rings are crafted from 14k gold. 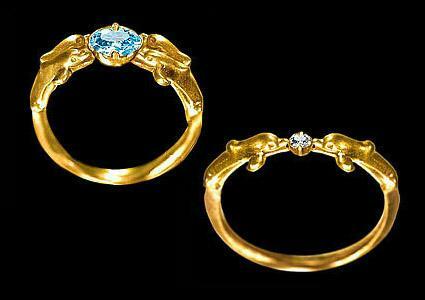 The Double Porpoise Dolphin Engagement Ring has a beautiful wave design with two jumping dolphins. You can choose from 14k white or yellow gold, and the ring comes ready for your 1/4-carat diamond. It retails for about $400. If you're interested in a wedding band, Seawear has rings for both men and women. The Triple Porpoise Dolphin Wedding Ring features an engraved wave design with three jumping dolphins and works for men and women. It comes in any combination of white gold, yellow gold, and platinum and retails for just under $1,350. You can order from Seawear through the mail, over the phone, or online; however, the most efficient way for them to process your order is through the website. Seawear does not have a retail store. Unfortunately, there are no outside consumer reviews for Seawear, which has been in business since 1998. However, they do have a number of customer comments and testimonials on their site. Past customers praise the company's customer service and beautiful products. Seawear ships many order same-day, but they caution that it might take as long as 12 weeks to get your ring during their busiest times. Custom orders also take longer. Seawear accepts returns of unworn rings that haven't been engraved, unless the ring is a custom piece. You have 10 days to return any piece you don't love. Seaside Designs specializes in marine life jewelry, and they have a great selection of dolphin rings at a number of price points. You'll find many unique engagement and wedding ring options. All of the rings at Seaside Designs are made from 14k gold or sterling silver. Some feature diamonds and other precious gems. The Twin Dolphin Band with Diamonds is a great choice for an engagement ring. Crafted from 14k yellow gold, this ring features two dolphins with diamond eyes. There's a mounting that can accommodate your one-carat or smaller diamond. This ring retails for $875. The Ladies' Open Dolphin Wedding Band is a beautiful choice for a wedding ring. The 14k yellow gold, 1/4-inch band features several jumping dolphins and openwork waves and retails for just under $950. A matching men's version retails for just under $1,250. Seaside Designs does not have a retail store. Instead, they conduct all business through their website. There are no outside consumer reviews for Seaside Designs, but they do have several testimonials on the site. Customers are effusive in their praise of the quality and beauty of their rings, as well as the company's customer service and quick shipping. Seaside Designs offers free shipping via UPS ground or US mail. Express delivery is also available. They ship most rings within two to three weeks of your order. After receiving your order, you have five days to return it for any reason. If your ring is custom made or engraved, it's not eligible for return. 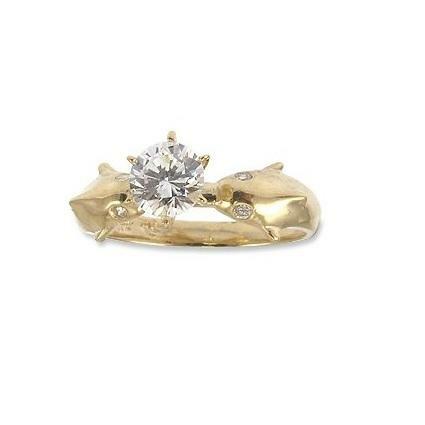 Dolphin Design Ladies' Engagement Ring - This pretty ring from Amazon.com is crafted in 14k yellow gold and features two dolphins with cubic zirconia eyes and a center round-cut cubic zirconia. It retails for about $280. Dolphin Engagement Rings and Ring Guard - Whitfield Jack Jewelry Genius offers three dolphin engagement ring designs and a ring guard, all in 14k yellow or white gold. Prices vary depending on the center stone, ranging from about $130 to $6,000. Whether you're shopping for a unique wedding ring or an engagement ring that shows off your one-of-a-kind personal style, dolphin designs offer beauty and charm. There are lots of lovely rings to choose from, so take your time checking out the options before you select the perfect ring for you.